Complement your bedside with this quaint nightstand. It features two drawers and an open storage area. The simple design will bring a casual contemporary look in your bedroom. Keep bedtime accessories, magazines, books and more stowed away in this bedside table. The City II 2 Drawer Nightstand by Modus International at Dunk & Bright Furniture in the Syracuse, Utica, Binghamton area. Product availability may vary. Contact us for the most current availability on this product. Storage Two storage drawers. Open Shelf. Drawer / Shelf Construction Sanded & stained solid wood drawer boxes with English dovetail joinery and felt lined top drawer. Solid wood drawer fronts. The City II collection delivers the same chic, modern styling as its older sibling but at a more affordable price. The upholstered faux leather low profile sleigh bed, dresser, mirror, and chest are constructed with tropical mahogany hardwoods and veneers finished in a deep Coco or Bright Pecan finish to match your individual decor. 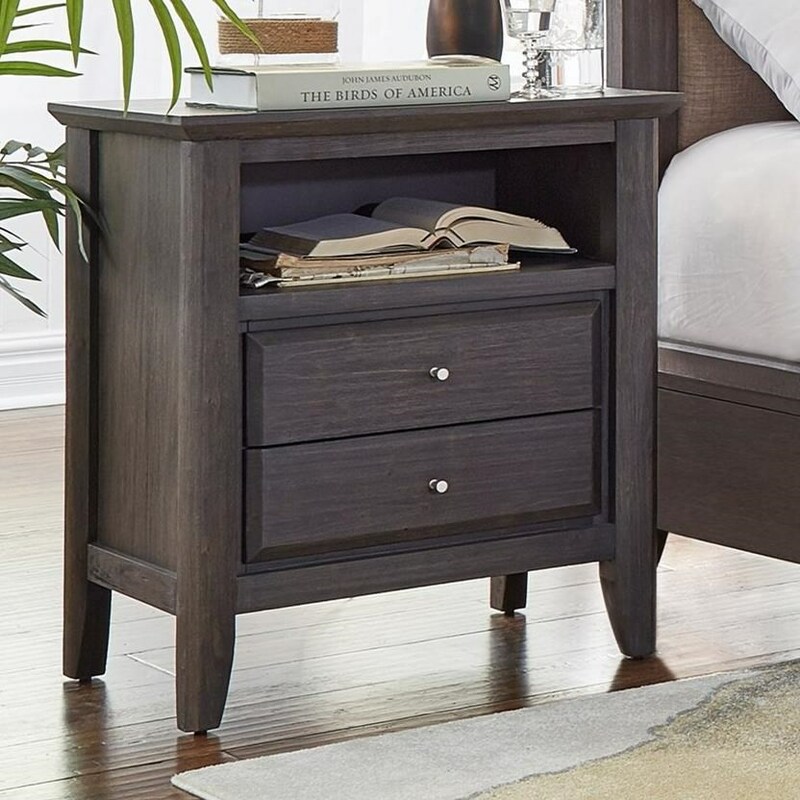 Storage pieces bring much-needed organization, while the handy charging nightstand allows you to power up your cell phone or tablet while you sleep. Full extension ball bearing drawer glides, sanded and stained solid wood drawer boxes with English dovetail joinery and felt lined top drawers add to the quality construction for lasting use. The City II collection is a great option if you are looking for Contemporary furniture in the Syracuse, Utica, Binghamton area. Browse other items in the City II collection from Dunk & Bright Furniture in the Syracuse, Utica, Binghamton area.